Last month the Midwest faced historic floods that devastated rural communities, drowned farms, contaminated water supplies, and resulted in billions of dollars in damages. As climate change exacerbates the risk of these catastrophic flooding events in the Midwest and throughout the U.S., a growing number of citizens will need support rebuilding their homes more resiliently or relocating to safer, higher ground. Congress can help citizens take these actions to adapt to the risks of climate change by adopting a package of climate-smart reforms for the National Flood Insurance Program (NFIP). Though Congress has stalled on NFIP reform in recent years, it will have yet another chance in May—the next deadline for long-term reauthorization of the program. A new article from the Sabin Center and the Natural Resources Defense Council, released in this month’s Environmental Law Reporter, provides key recommendations on how to change the NFIP for a changing climate. 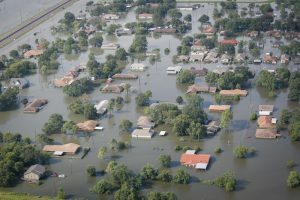 Congress established the National Flood Insurance Program (NFIP) in 1968 to reduce flood damages nationwide and ease the federal government’s financial burden for providing disaster recovery. In pursuit of these goals, the NFIP provides federally backed insurance to property owners and renters in communities that establish minimum requirements for building, land use, and floodplain management practices that reduce flooding risk. Over it’s lifetime, the NFIP has provided 5.1 million flood insurance policies providing $1.3 trillion in coverage. But due largely to recent flood disasters and charging insufficient premiums that don’t reflect homeowners’ true risk exposure, the NFIP has sunk over $20.5 billion in debt. The NFIP already faces escalating costs at least partially due to exacerbated flooding risks and sea level rise from climate change—and these risks are mounting. A Federal Emergency Management Agency (FEMA) sponsored study estimates the Special Flood Hazard Area (SFHA), the area within the 100-year floodplain subject to development restrictions under the NFIP, will grow by between 40% to 45% by 2100. The combination of a growing floodplain and population growth will drive demand for a greater number of NFIP policies, further overloading the program—unless it adopts meaningful reforms. Collectively, these reforms can help restructure the NFIP to prevent escalation of debts, reduce taxpayer burden, and most importantly increase the safety of millions of vulnerable homeowners.